The real test of a yacht’s credibility is not on launch day, fresh from the yard and in her Sunday best; it comes six months on, away from the prying eyes of everyone but the owner and his family, of those who have lived and breathed the yacht in all kinds of conditions. In quantitative terms, the all-aluminium Quinta Essentia, the 55-metre Heesen launched last year, has certainly been busy. The owner’s daughter reels off the itinerary thus far: “After my wedding in Capri last June we cruised to Sardinia, and then on to Corsica. In August we were in Greece, and at the end of August Croatia for my honeymoon. After attending the Monaco Yacht Show we cruised back to Sardinia for a week. Then in November we went to Lanzarote and we celebrated the New Year in Cap Verde,” she says. 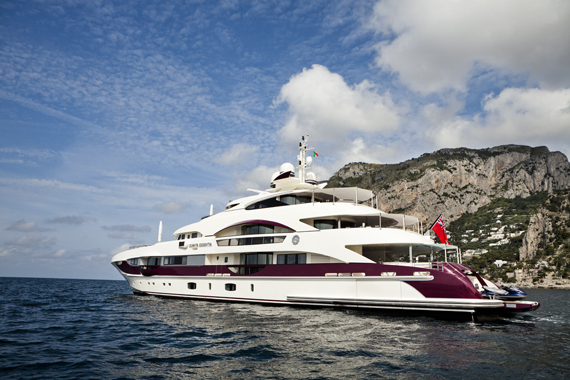 Sea miles are the best recommend of a yacht’s talents: Quinta Essentia is clearly owned by a very happy family. This experienced yacht-owning family had previously linked up with Heesen for Celestial Hope, their 47-metre semi-displacement. Indeed, it was in 2007 while Celestial Hope was still in build that the owner started to investigate the notion of a bigger yacht. “We were on the plane over to the yard and the owner made a sketch – he wanted a fast yacht with a very big owner’s cabin, a waterfall and pool, balconies and a deck dedicated to gym and spa. That became Quinta Essentia,” says Sergei Dobroserdov of Nakhimov Yachts, who project-managed both builds. Frank Laupman of Omega Architects was brought on board at this stage. “I was given a sketch, a patchwork profile of a yacht with a big square hole in it!” says Frank. “But this expressed the owner’s desire to look out freely from anywhere on board. Everything about the yacht was big.” In fact, Quinta Essentia is Heesen’s biggest yet, a graceful presence, and with something of the athlete in her poise on the water and in her toned superstructure. The performance is pretty sporting, too: twin 4,300kW MTUs deliver a 24-knot top speed. The family have clearly approached the new project with a thoroughly open mind. Gone is the set-piece dining table in the main salon (so often a neglected area on board, simply because yachts offer many more convivial, less formal places to eat). It was a case of the owner deciding that he only dines on board with friends and that he wants them on the bridge deck, where it is more comfortable. With no state banquets to serve, the galley has been transported to the lower deck, creating more main-deck space for the owner’s suite. Outside and inside, there are many places to gather in groups or to grab a quiet moment with a book. On the bridge deck there is a range of spa facilities, with a gym, sauna and steam room, while the main salon – without the formality of a dining table – has a relaxed ambience, the perfect location for cosy conversation. 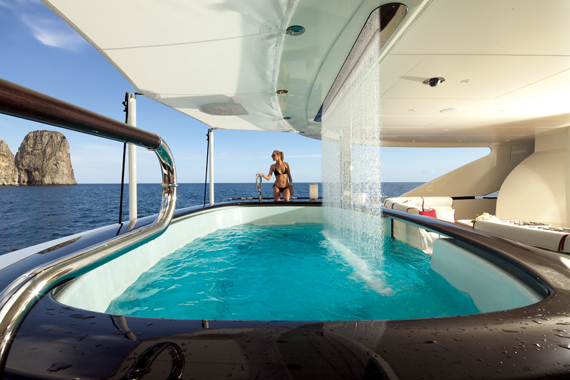 This is a yacht that is full of options for those on board. Inside, the first thing that impresses you is the amount of natural light, with the bridge deck lounge and owner’s suite benefiting from glass balconies and bulwarks. The generally light materials used for carpets and upholstery combine with the clever use of glass to create an illuminating whole. “The interior décor of Celestial Hope had a distinct feeling of the Hamptons but we wanted something more amazing for our new vessel,” says the owner’s daughter. “Because we wanted something radical, we asked Ken Freivokh for a revolutionary interior. We loved it, but we also wanted a feminine and elegant touch, which is why we chose to refine the décor with Michela Reverberi.” It is, perhaps, an unusual combination but it works very well. Ken Freivokh’s signature is in the dramatic glass stairs, flooring and elevator; Michela Reverberi’s input on the wall surrounding the staircase supplements this with silver-painted curved glass from Pictet, creating what Reverberi herself describes as “an ice cascade”. She says that she took her inspiration from those “unexpected sources of light” on board. On the main deck this is best illustrated in the vast owner’s suite, a space which the off-centreline bed opens up considerably. There is no owner’s office as such, though there is a dedicated laptop station to port. The balconies offer a wonderfully discreet escape. Riverberi has added some silver flourishes – the material used for the cushion covers and the bedspread – to make the most of the natural light. The bridge deck lounge is another space where radical rethinking has paid off. The main dining table aft is by the arc of opening doors, with all the outside/in possibilities that creates. A sofa area mirrors the configuration from the main salon, and there’s also a baby grand piano. 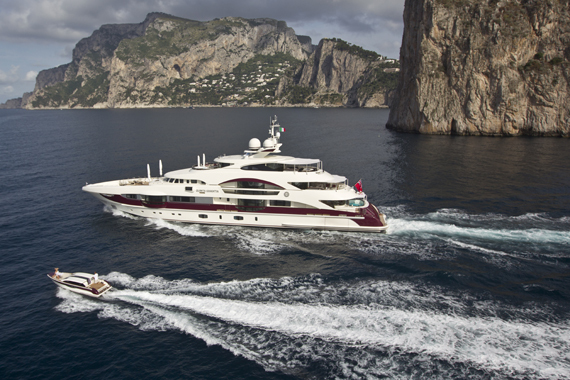 Quinta Essentia is the result of a family who wanted their yacht to be the very best element in their life, rather than just a trapping or a toy. You won’t find anyone disputing the notion that they have produced just that. Quinta Essentia remains, like a Fourth Grace or a Sixth Sense, something unexpected, surprising and unique.